SNORKEL FULL FOGPROOF WATERPROOF FACIAL MASK: makes it easier than ever to breathe naturally through your mouth or nose while you are snorkeling. 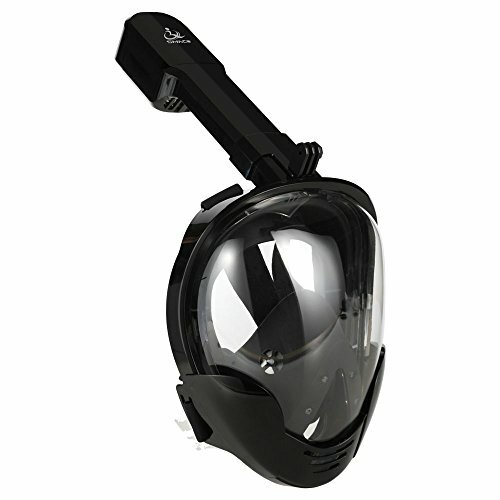 Our mask provides a 180¡ã viewing area- the biggest of any snorkel mask on the market today guaranteeing that you will see more fish and sea creatures than ever before. REPLACEMENT FOR GoPro ACTION CAMERALMOUNT INCLUDED: easily attach your GoPro camera for awesome underwater shots. 180 Degree FULL FACE PANORAMIC ROUND LENS DESIGN- makes it easier than ever to get the paranamic view under seawater.while you are snorkeling.